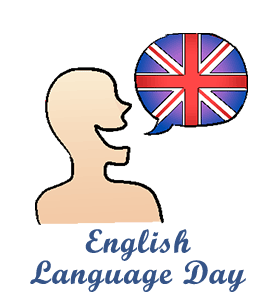 ﻿English Language Day: Calendar, History, Tweets, Facts, Quotes & Activities. English Language Day seeks to entertain, inform and increase awareness of the history, culture and achievements of the English language. English is a Germanic language and the most widely spoken language in the world , earning the name of the lingua franca of the modern era. English Language Day was established by the United Nations in 2010 in an effort to promote the organizations six working languages. English Language Day is celebrated annually on April 23rd, the birthday of William Shakespeare, one of the most famous and well-celebrated English play writers and authors in history. There are six total working languages among the UN community and five other language days. They are: Arabic, Chinese, French, Russian and Spanish. There are approximately 106 total countries that use English as a first-language and some 339 million first-language speakers (i.e. it is their first and primary language spoken) worldwide. The English language can trace its origins back to the year 450 when invading German tribes spoke a similar language. The language of this time period came to be referred to as Old English. Native English speakers today would have trouble understanding it, as it has many differences to what we now consider the English language. The current English language spoken at present is referred to as Late Modern English. It originated around the year 1800 and the biggest difference between it and early modern English is that it has more words, which were created in order to name new technologies during the industrial revolution. Read one of William Shakespeare’s many plays. Some of his most popular plays are Romeo and Juliet , Hamlet , Othello and King Henry IV. Spread awareness on social media by using the hashtags #EnglishLanguageDay, #English and #EnglishDay. Volunteer at a local ‘English Second Language’ center that provides incoming immigrants with language training. Many of these centers operate with volunteers and you can help the learners practice their English. Research and learn a bit more about the evolution of the English Language such as The Story of English, the Adventure of English and English: The Birth of a Language.